We're all wildly familiar with (and envious of) French women's style, which is famed for its timeless, effortless vibes. But French women's beauty routines are worthy of equal attention. Unlike the beauty aisles of American drugstores, which are fathomless infernos of too many products, the French pharmacie is a place of modest wonder—offering just a handful of affordable skincare, makeup, and haircare brands that help French women keep their skin clear and their hair healthy without overspending or too much fuss. Aspiring to approach drugstore beauty like a French girl, we hit up a handful of our favorite French fashion influencers and asked them this: If you were to walk into a pharmacy and buy two or three beauty products, what would they be? Keep scrolling to find their answers. French women like Ellie of @slipintostyle are collectively obsessed with this iconic makeup remover, which has a super-gentle, vitamin E–rich formula—perfect for sensitive skin. Aloe vera and shea butter are a couple of the key ingredients in this impossibly light, milky moisturizer, which protects the skin's moisture barrier without clogging pores. This moisturizer for dry feet and cracked heels is an unexpected French-girl staple: The nourishing, anti-inflammatory formula is packed with shea butter, lipo-aminoacids, and vitamin A.
French women swear by this classic face mist for its soothing, skin-softening action. Spritz this stuff after cleansing (before moisturizing) or at any point throughout the day to reap its complexion-calming benefits. Consistently delivering high-performance formulas, drugstore skincare brand La Roche-Posay has a place in almost every French beauty guru's arsenal. This ultra-moisturizing day cream is a staple in Parisian influencer Barbara Malewicz's routine. This multi-purpose combination of plant oils and vitamin E can be used on the face, body, or hair as a nourishing, repairing treatment. Its smell alone is worth the price tag. Parisian influencer Monica de La Villardière calls this shampoo-conditioner combo "super nutrition for your hair." For only $9, this ridiculously rich conditioner repairs dry and damaged hair, leaving it soft and bouncy in that nonchalant French-girl way. It's so hard to find a non-greasy, non-chalky, non-stinky sunscreen at the drugstore—that's why this featherlight, non-comedogenic, fragrance-free formula is such a gem. No need to spend $50 on a face scrub—this little-known dermatologist-approved formula uses both physical and chemical exfoliation to keep the skin bright and breakout-free. 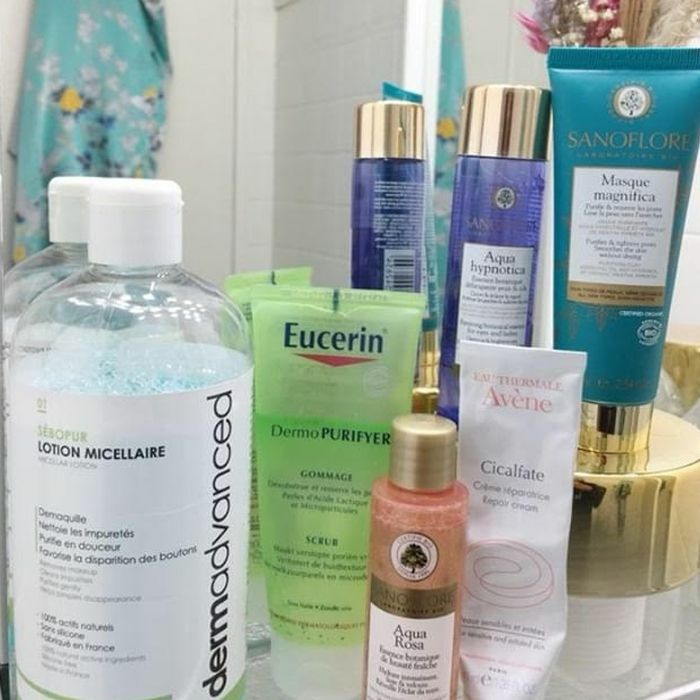 This super-healing, balm-like moisturizer for dry and sensitive skin has a permanent place in Paris fashion girl Franny Fyne's medicine cabinet.